After a lifetime of radical anti-American activism and passionate legal advocacy for foreign and domestic terrorists, cop-killers, and gangsters, convicted terrorist enabler Lynne Stewart died at her home in Brooklyn – instead of in prison where she was supposed to be. That represents only part of the life story of the self-described “radical human rights attorney” and cheerleader for totalitarianism. This outspoken, persistent, quick-witted woman didn’t look like a zealous subversive. She may have been a bit too extreme for many liberals but they gave her a pass because, after all, her heart was in the right place. To the Left, this Maoist who said she favored “violence directed at the institutions which perpetuate capitalism, racism, sexism, and at the people who are the appointed guardians of those institutions,” was an endearing, grandmotherly figure blessed with a disarming honesty. This lovable, folksy ball of fluff hailed the Black Lives Matter-inspired killers who gunned down police officers in Dallas and Baton Rouge last year as noble freedom fighters. After being diagnosed with terminal breast cancer, Stewart was released early from prison in January 2014 by a sentimental Clinton-appointed judge at the request of the Obama administration. She was supposed to stay caged until 2018. Her passing came 18 days after the behind-bars death of her most prized client, the 78-year-old convicted Islamic terrorist ringleader Omar Abdel-Rahman, also known as the Blind Sheikh, with whom she used to flirt during prison visits. He had received a sentence of life imprisonment in 1996. But Stewart’s work for her infamous client was her undoing. In 2005 she was convicted in federal court in Manhattan of providing material support for terrorism. While acting as legal counsel to Abdel-Rahman she violated a national security-related gag order by relaying a message from her client who was convicted of masterminding the 1993 World Trade Center bombing in which six people were killed and more than a thousand wounded. The communiqué, from a prisoner who was held incommunicado specifically to prevent him from directing terrorist activities from his prison cell, was “the blessing of a return to violence from a terrorist leader,” prosecutor Anthony Barkow said. In the message, Abdel-Rahman urged his disciples in Al-Gama’a al-Islamiyya (in English, Islamic Group), to abandon a ceasefire with the government of Egypt and resume terrorist operations. Prosecutors said he waged a “war of urban terrorism” aimed at pushing the U.S. to withdraw its support for Israel and Egypt. One of his followers, El Sayed Nosair, was convicted in the 1990 murder of Rabbi Meir Kahane. Years before, he issued a fatwa linked to the assassination of Egyptian President Anwar Sadat. He was a spiritual leader of al-Qaeda and other jihadist groups like the Muslim Brotherhood and a symbol of holy righteousness to his followers, including deposed Egyptian President Mohamed Morsi. A year after Rahman was sentenced to life in prison, terrorists from his Muslim Brotherhood splinter organization, the Islamic Group, carried out the Luxor Massacre in Egypt. European tourists had their ears and noses cut off before being killed. 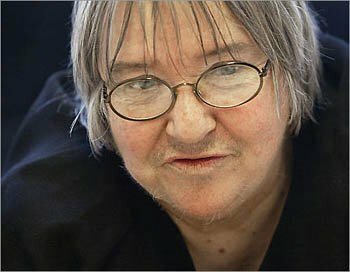 The attack had been carried out to take hostages to exchange for Lynne Stewart’s client [i.e. Abdel-Rahman]. A note calling for the release of Rahman was found in a disemboweled body. At Stewart’s trial for serving as a terrorist’s mouthpiece, prosecutors said she made loud noises when visiting her client so guards wouldn’t notice that she was acting as a go-between. She maintained the distractions were necessary to protect attorney-client privilege. Stewart said at the rally that she thought of herself as a victim of U.S. government oppression. But I do think that I’m now facing 30 years, not because of what they accuse me of having done, which really I’m completely innocent of and they understand that, too, but really for being 30 years as a movement lawyer and for the 10 years before that, being opposed to their war in Vietnam, being opposed to the racist policies of the Board of Education of the City of New York and fighting against that and standing up for people, regardless of the circumstances, who really were designated enemies of the state. So, I’m here today, as an enemy of the state myself … But when I say “the state,” I think of myself, and I know that the tabloid press of New York, notably the New York Post, refers to me as [a] “traitor lawyer.” And that, to me, is not at all true. I think that I’m a greater patriot because I didn’t just come out in the sunshine and when it was good weather but I came out when it was bad weather, and when things were very, very much at a low ebb and I spoke up and I said what had to be said, and I continued with my work and I defended the people who needed defense. That was my job, that’s what I did. The Left likes to refer to some of its legal heroes like Stewart and Sixties icon William Kunstler as “People’s Lawyers.” It’s not what you might think. A “People’s Lawyer” – the phrase is always capitalized – is a crusading, small-c communist attorney who devotes his life to using the legal system to fundamentally transform America. As such it is a profoundly antisocial, un-American concept. Guild members reject the wisdom James Madison imparted in his 1792 essay titled “Property.” Madison argued that individual rights are inseparable from property. Where an excess of power prevails, property of no sort is duly respected. No man is safe in his opinions, his person, his faculties, or his possessions. Where there is an excess of liberty, the effect is the same, tho’ from an opposite cause. Government is instituted to protect property of every sort; as well that which lies in the various rights of individuals, as that which the term particularly expresses. This being the end of government, that alone is a just government, which impartially secures to every man, whatever is his own. The Guild-affiliated People’s Law Office in Chicago, which goes by the fitting acronym PLO, brags of its efforts on behalf of the supposedly downtrodden against the system. “We have defended activists who have been targeted as a result of their political beliefs or organizing efforts on behalf of movements struggling for social justice and liberation,” its website states. If Stewart had lived in the Windy City, she could easily have landed a job with the PLO given her defense of America’s most aggressive social justice warriors. She was choosy in selecting clients. “If I can’t give it my heart and soul, I won’t represent somebody,” she said. Lynne Stewart was true to her word.